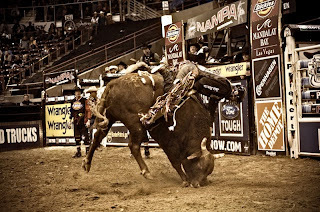 This cowboy gets a horn to the face. Good thing he was wearing a helmet since the majority of the riders weren’t. One such cowboy, after receiving a high score smiled up at the camera and I was shocked to find only ONE tooth in that victorious grin. That’s a lot of bull spit. 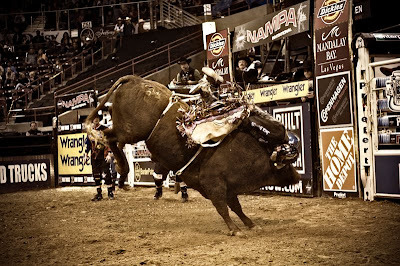 This rodeo clown got pretty lucky sinces the legs of this bull’s buck went on either side of him. However, I’m sure the view and the smell were less than favorable, though probably preferable. 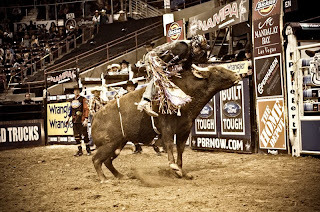 *See more amazing rodeo shots on Nate’s website! He has some phenomenal pics! Buckley - Nate, You could make quite the impressive expert Rodeo photographer (if there is such a thing…) I am always quite impressed with your incredible talent. All of your pictures are breathtaking and bring you right into the action. Keep it up. Mandy - GREAT shots Nate! Ken & Jen - OUCH!!! Nate: Wasn’t it you that lamented that your life was boring because you weren’t born a cowboy? Fun to see more of your AMAZING rodeo photos! After I am done marveling over the photos themselves, I get a chuckle, thinking of you in the press box. There really is a little cowboy in you, isn’t there!